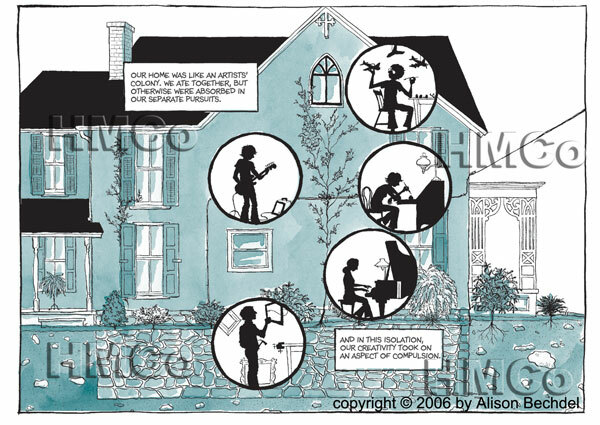 For Christmas, my fab sister gave me Alison Bechdel’s Fun Home: A Family Tragicomic. (Okay, she gave it to Hassan, but she knew I’d read it too.) Bechdel is the author/artist behind the successful and hilarious comic strip, Dykes to Watch Out For, and Fun Home is her autobiography in graphic form. The main thrust of the story focuses on her relationship with her father, an English teacher who is obsessed with the historic restoration of their gothic revival home. His hobby makes the family’s home a bit like a museum – both in its archaic beauty and its stifling atmosphere. Dad seems more interested in restoring the shingles to their former glory than he is in showing any affection for his kids. In college, Alison comes out to her parents. She prepares herself for rejection but gets something possibly even more overwhelming: she learns her father has had affairs with men, including her former babysitter. A few months later, as she’s still processing this new understanding of her family history, her father dies in what may have been suicide. It mean some like these are spoilers, but all of this is clear within the first few pages. Alison unfolds the narrative of her family not-quite-chronologically, going back and forth in time, creating a picture that grows more complex and fascinating with each new detail. At some point, I think I may haveto re-read the book just to get a better understanding of how she structured it. Bechdel is an exceptional master at using the combination of words and pictures, for maximum, astoundingly efficient effect, as in the image below. She tells her story with honesty and skill, and along the way draws on everything from the Icarus-Daedalus myth to Stonewall and James Joyce. And on the final page she manages to bring her non-linear narratives together in a way that added yet another layer of complexity to her story and was also deeply moving. Go forth and read it – you won’t be disappointed! This entry was posted in Comics, Fiction, Pop culture, Recommended books and tagged Alison Bechdel, Dykes to Watch Out For, Fun Home by benfrancisco. Bookmark the permalink.